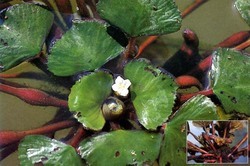 Habitat : Throughout in india, in ponds, lakes and tanks. Uses : Fruits are sweet, astringent, coolin, haemostatic, appetizer and tonic. They are useful in vilated conditions of pitta, burning sensation, dipsia, dyspepsia. They are also used in case of intermittent fevers, fatigue, inflammation, bronchitis and general debility. Flour made from fruit is suitable for textile-sizing and is good substitute for corn starch in ice cream manufacture.